Equidistant on parallels and meridians. 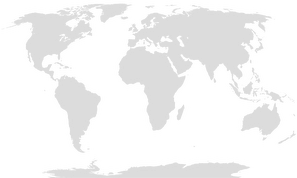 True scale along the central meridian and a selected parallel (at the equator in the image). Equidistant on parallels and meridians. True scale along the central meridian and a selected parallel (at 40° North and South in the image). To demonstrate the effect of choosing a standard parallel other than the equator.